April 2, 2014 You Can’t be a Successful Facebook Page Admin Unless You Do These 6 Things! Are you still assessing what works and what doesn’t for your Facebook Page? That’s okay, many business owners and social media managers are. This article includes six simple tips we use at ShortStack, tips we think make us more effective admins, and make our Page more professional. We’re sure they’ll help you, too. 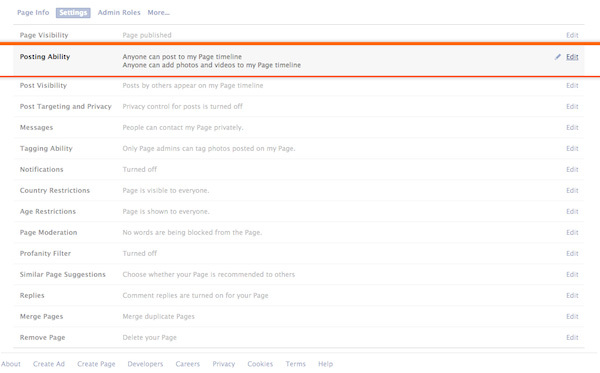 From there, edit the “Posting Ability” tab and decide if you want “everyone” to be able to post on your Page, or if you want to allow only your page Admins to post. While I normally advocate allowing open access to a Page, and even leaving negative posts up so your customers and future customers can see how you deal with criticism, for some businesses it’s just simpler to let people message you privately if they have an issue. Setting to “Posts by Page Only” also prevents Facebook users from spamming you. There are two basic types of Facebook Page admins: Those who post based on hunches as to what motivates engagement, and those who look at Facebook’s Insights to see what actually drives engagement. Checking Facebook Insights will help you give your fans what they want. For example, if you notice that the posts which don’t include images have better reach and engagement than those that are text only, try removing the images to see what happens. A few months back, Facebook did a complete overhaul of Facebook Insights and Jon Loomer wrote a nice article for Social Media Examiner that walks you through the latest features. 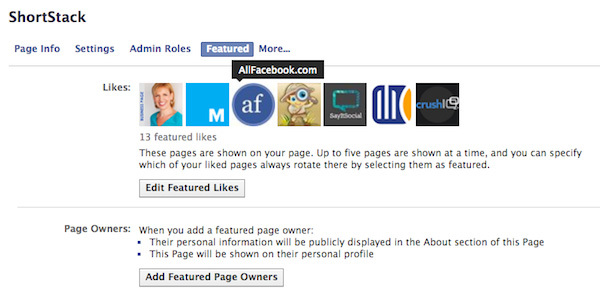 Facebook allows five different administrator roles: Manager, Content Creator, Moderator, Advertiser and Insights Analyst. Each role has different capabilities — only Managers have the ability to change each admin’s role. Facebook makes all admins managers by default. • Have a quarterly Facebook training session. Discuss roles and address etiquette and expectations for employees who manage the Page. At the quarterly meeting, discuss new Facebook features, address concerns about previous posts and talk about new tactics that you’d like to implement. • Define the voice of your Page. Each individual has a unique voice, but when representing a business or brand on a Facebook Page the Page admins should work together to form a consistent voice. Make sure that your Page admins understand the established voice and that they are expected to use that voice when communicating with users and fans online. • Keep a shareable document (e.g., a Google doc) that outlines company social media policies. Employees should refer to the document at any time when they need to know what to post — and what not to. This document should also include recommendations about how to interact with your Facebook fanbase. • Keep admins to a minimum. Don’t give just anyone admin rights to the Facebook Page. The fewer people managing a Page, the better. Two or three admins actively updating, responding to inquiries and managing the Page is plenty. • Keep communication between admins open. “If you’re not sure, ask!” is an elementary concept, yet it’s an important one. Whether responding to a particularly difficult user comment or sharing an article on Timeline, establish a rule of thumb that if any admin is unsure about whether or not something is appropriate, s/he should ask another admin for an opinion. Encouraging Page admins to have open communication with one another will help reduce mistakes. Liking other business Pages helps you build connections (and when they reciprocate, gives you added exposure) but you might not want certain Pages to be among the first things visitors to your Page see. Luckily, you can control which of the Pages you’ve Liked appear on your Timeline. Five of these Likes are displayed at any one time, and the five that appear randomly change each time the visitor to your Page refreshes — unless you edit which Pages appear. To choose featured Likes, go to your Admin Panel, choose “Edit Page” then “Edit Settings.” Next, click “More” and then select Featured. From there you can edit your featured Likes. 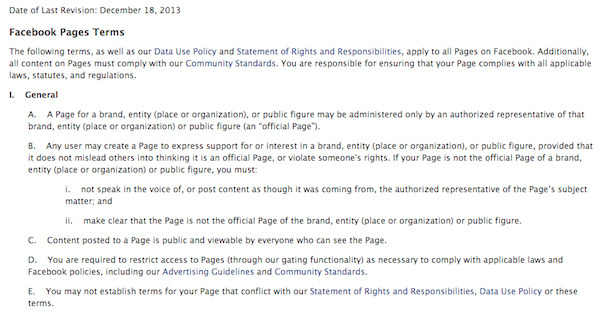 Facebook changes its terms of service…..often. And unless you follow the company’s blog, or frequently check their Page Guidelines it can be difficult to keep track of what’s allowed — or not — during a given month. Of course reading social media blogs, like Social Media Examiner, will help you stay in the know, but Page Admins should still bookmark Facebook’s Page Guidelines and read the document at least once a quarter. Chances are if you’re the admin of a Page, you simply head over to your business Page and when you comment or post, you act as the business. But did you know that you can actually change your profile so that you are on Facebook as a “Page” and not just as a personal profile acting as an admin on the Page? Why would you want to do this? If you happen to own or work for a B2B company, it’s a good way to build alliances with other businesses that are in your same industry (but aren’t competitors). Let’s say you own a restaurant….you’d want to interact with hotels nearby so that when people check out the hotel’s Page, they see your (positive and helpful) comments and are motivated to check out your business. Of course there’s a fine line — you don’t want to post too often, or be so complimentary that your posts appear insincere, spammy or otherwise annoying. But posting as a Page is a great way to network with similar businesses and leverage the marketing power of Facebook. 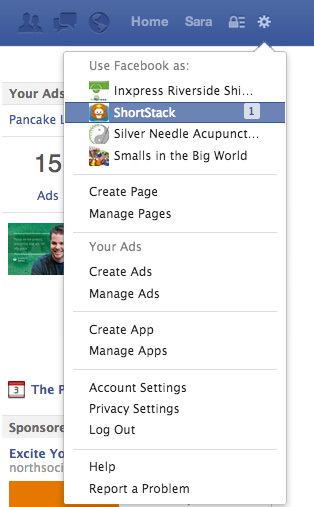 To act as a “Page” on Facebook, click on the settings icon in the top right corner of your Facebook profile and you’ll see an option to “Use Facebook As” with a list of the Pages you admin. When you choose to Use Facebook As a Page you are able to not only Post and Comment as that Page but your News Feed contains the updates from the businesses your Page follows instead of your personal friends and Page Likes. Hope you find these tips helpful as you look for new ways to invigorate your Facebook presence! The original version of this post appeared on Social Media Examiner.